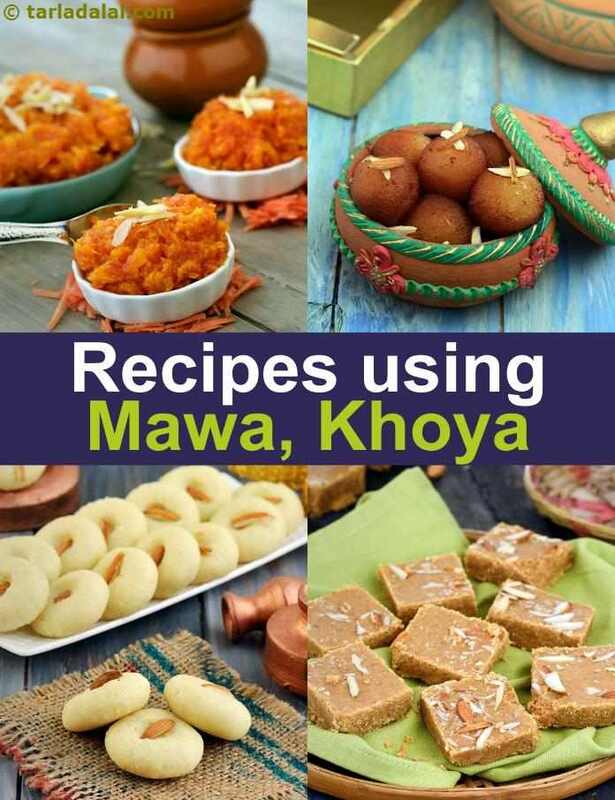 Recipes using Mawa/Khoya. Indian Mawa Recipes. We are very familiar with Pedas, Halwas and Gulab jamuns, mostly because they are every Indians' favorite desserts, but hardly anyone knows what these sweets consist. All these have one very important ingredient in common, it is called Mawa, Khoya. Mawa is made by boiling milk for a long period of time to evaporate the water in the milk so that only milk solids remain. Milk is boiled on a medium to slow flame, to prevent it from burning and sticking to the bottom of the pan. Even though it takes a long time to make it, it is worth the effort. The reason for adding mawa to certain dishes and sweets is for the richness and creaminess it provides. With its addition, the quality certainly improves but it also provides an intense milky flavor which would certainly be absent if not for mawa. 2. Danedar mawa – the texture of this mawa, as the name suggests, is crumbly and grainy. All those sweets that require such a texture like Kesar Pedas, use this type, which is also the most commonly used. 3. Batti mawa – this one has the least amount of moisture and is hard. Usually it is grated and used for various sweets like barfis like this Coconut Kesar Barfi. Due to the versatile nature of it, mawa is the main ingredient in an array of Indian sweets ranging from barfis, pedas, ladoos to kalakand and halwas. Kala Gulab Jamun, one of our absolute favorites, is super sweet and made with Chikna Khoya to give it a smooth texture and dipped in sugar syrup. Even festivals celebrated with full vigor are incomplete without these sweets. For instance Lavang Latika is made after Durga Puja, with a filling of mawa encased in maida, deep fried and then soaked in sugar syrup! Contrary to the popular belief, mawa is a great for making certain subzis. This was originally started very early on by the Mughals, who utilized it to the fullest extent. Nawabi Kesar Koftas is one such recipe. The name 'Nawabi' is apt for it since it is very rich in texture and flavor because of the addition of mawa, paneer, potatoes and other dry fruits. Another great dish is the Vegetable Shikampuri Kebab, which is mawa mixed with vegetables and an assortment of spices, pan fried to perfection to give the true Mughlai feel. Whether you are making Peshawari Paneer, or using mawa as a garnish in Zarda Pulao, it is sure to provide a luxurious feel. Everyone loves makhanas, but who knew you could mix them with mawa to get this amazing recipe! Khoya Makhana is a dish perfected by deep frying the makhanas in ghee and making a tangy khoya gravy to go with it. But if you are craving dessert, there are these delicious Pista Choco Rolls, which truly makes for a unique mithai due to the mix of chocolates and pistachios. Enjoy our Mawa recipes, Indian Khoya recipes below.